Stand and try, imagine, that you are relaxed and feel comfortable. Imagine / see / feel your energy field all around you like a sphere that you are standing in the middle of. Bring your energy field to a distance around you that is comfortable for the situation you are in – at home this will be between 4 and 6ft (1 -2 meters), in busy places about 2ft (less about 1/2 meter). Your energy field has a semi-permeable membrane and you get to set with your intention what you want to let in and what you want to release. Put a symbol of your choice, I like a flower, on the front, back, top, bottom, left and right of your energy field. These symbols will act like “Lightening rods” in that energy that is not beneficial for you will touch them and be pulled into the ground and therefore not enter your energy field. I like to join my symbols up. “I own this physical body. This physical body is part of me. I am the Queen / King of my physical body. I decide what enters and leaves my physical body. I am grounded and present in my physical body”. Stay still, until you sense what you have said physically in your body. For me this feels like I am more present and grounded and I feel ‘stronger’, maybe a better way of saying this is I feel more ‘contained’ in a relaxed way. “I own this energy field. This energy field is an extension of me. I am the Queen / King of my energy field. I decide what enters and leaves my energy field. My physical body is grounded and present in my energy field. My energy field is grounded and present”. 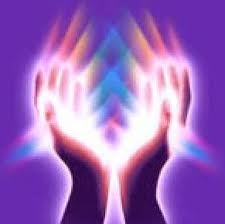 Allow your physical body to extend and relax in the boundaries of your energy field. Remember that your energy field has a semi-permeable membrane field, and that you choose what comes in or out – you set this with your intention.